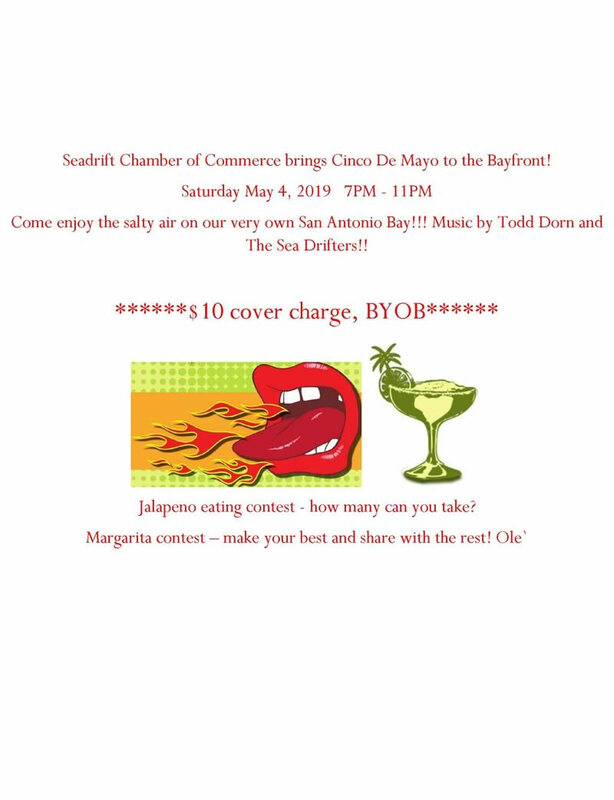 Please welcome our new 2019 Seadrift Chamber of Commerce officers! Huge thanks to Cindy Alford(President) Cathy Epley(Vice President), Tracey Johnson(Secretary), and Kelley Sexton(Treasurer) for stepping in to these roles. And thanks to the 2018 officers for their work. Please mark your calendars to attend our regular meeting at FNB each month. We are excited to get everyone involved in the amazing projects that are in the works. We have formed committees and invite you all to sign up and volunteer for one or all of them. You can contact the chairman of each committee or any of the officers to sign up. The more help and volunteers we have the better our Chamber and town can be. Shrimpfest dates have changed!! Shrimpfest 2019 will be held on June 7th and 8th. 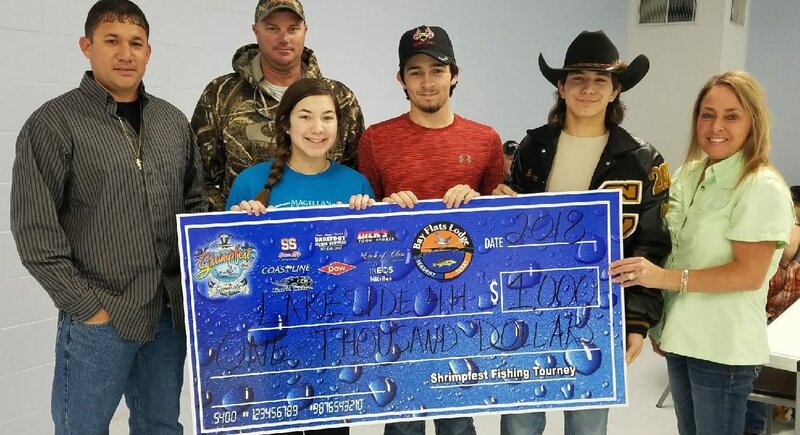 The Chamber of Commerce Shrimpfest Fishing Tournament was fortunate enough to have funds left over from our 2017 tournament that allowed us to give back to a local organization. 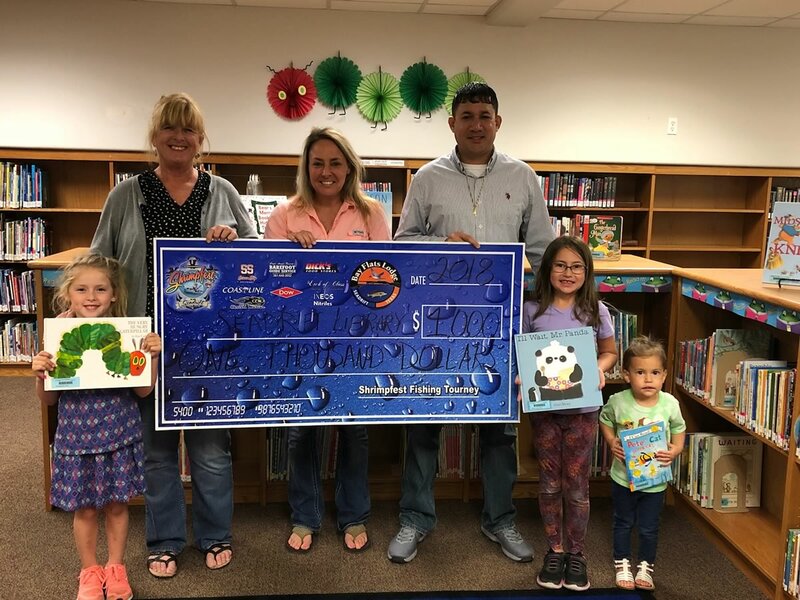 Pictured left to right: Chelsey, Librarian- Robbie Bess, Kristine Metcalfe- President Seadrift Chamber of Commerce, Austen Rivera -Tournament Committee Member, Payten, and Falen. We have presented a $1,000 donation check to the Seadrift Library to continue kid's education and an option to purchase additional books and reading materials. Pictured left to right: Austen Rivera, Jonathan Davenport-Tournament Committee Members, Briana Bordovsky, Canion Epley, Bryant Bordovsky-4H Officer's, and Kristine Metcalfe- President Seadrift Chamber of Commerce. We have presented a $1,000 donation check to the Lakeside 4H club to promote educational and youth development. Welcome to the Seadrift Chamber of Commerce website! Visit our small town and enjoy the beautiful sunrises, sunsets, sea-breezes, and spectacular fishing on San Antonio Bay. 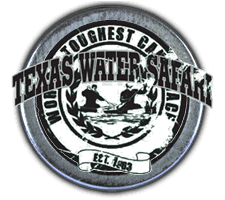 We are the home to the annual Seadrift Shrimpfest and The Great Texas Water Safari Finish Line. The Seadrift Chamber is a member-driven, non-profit organization supporting the City of Seadrift since 1975. We are your local business advocate that is focused on developing services to enhance the business climate in our community and establish Seadrift and Calhoun County as an economic leader on the Gulf Coast.